We are located just east of the U.S. Air Force Academy, and just north of the City of Colorado Springs. We treat our water for iron and manganese and distribute it from two water treatment plants through a series of booster pumps and water storage tanks. Our professional, highly trained staff ensure we provide our customers with the best water quality possible. 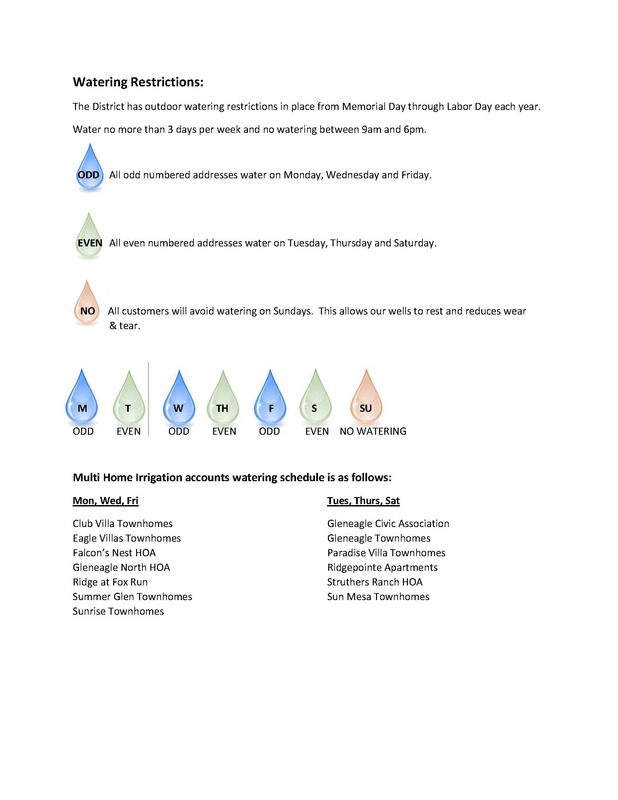 Our facilities are maintained to keep the neighborhoods we share with our customers looking as good as possible. Please come visit us. We&apos;d be glad to show you around and answer any questions you may have. The Donala Water and Sanitation District is located just east of the U.S. Air Force Academy, and just north of the City of Colorado Springs. We were formed in 1972 to serve the development that was later named Gleneagle and the Gleneagle Golf Course. Today we serve Gleneagle and the surrounding areas, as well as The Ridge at Fox Run, and Struthers Ranch. Please come visit us. We'd be glad to show you around and answer any questions you may have. Donala is a "quasi-municipality," a special district under Colorado statutes that is governed by a Board of Directors elected from within the District and run by a manager and staff. As a not-for-profit governmental entity, the District is dedicated to bringing the best and most economical water and wastewater service possible to the constituents, while adhering to the laws of Colorado and the regulations of the State Health Department and the EPA. Our primary water source is the Denver Basin of deep aquifers. We treat it for iron and manganese and distribute it from two water treatment plants through a series of booster pumps and water storage tanks. Since the Denver Basin is a dwindling resource, the District is very active in seeking a renewable source to augment and eventually replace it. In November 2008 the District purchased a 711-acre ranch (Willow Creek Ranch) near Leadville for the purpose of obtaining the water rights. It was adjudicated for municipal use in 2011. As part of that concept, Donala has leased renewable water from the Pueblo Board of Water Works - both to provide winter return flows to the Arkansas from the ranch, and as a straight lease. That water is conveyed, treated, and delivered to the Donala system through a connection to Colorado Springs at Northgate Road. The operation started in October of 2011, and currently provides water to meet about 30% of Donala&apos;s total demand. In 2017 we purchased the Laughlin Water Right and are currently undergoing court action to place that water into use. Once this is approved Donala will have 75% renewable water for its customers. The Board of Directors have set a goal for 100% renewable water by 2031. 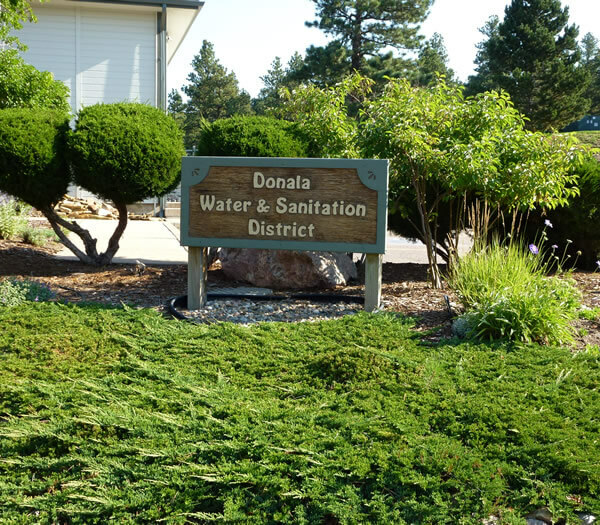 Donala also serves the wastewater needs of our customers. We are co-owners and operators of a wastewater treatment plant located just north of the Air Force Academy on the west side of I-25. The plant is a modern, state-of-the art facility that is strictly controlled to keep the waters of Colorado as pristine as possible. In addition, to do our part for conservation, we treat the wastewater to "swim beach" standards and use it for irrigation within Triview. © Copyright 2019 Donala Water & Sanitation District. All Rights reserved.